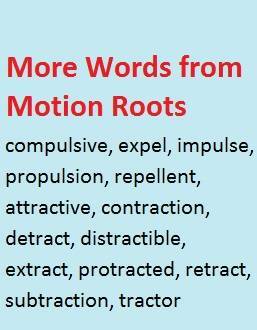 See each word below for more examples and explanations. Then try the matching exercise to see how many words you can recognize and match to their meanings. Bending our arms or legs causes us to flex our muscles. Lots of movement and exercise helps keep us flexible—able to move freely. Soldiers in the Greek and Roman armies used shields to deflect arrows or other weapons—to bend their course away from the body. A reflex is an automatic muscle response like jerking our hand away from a hot stove before we even feel the pain. A doctor tests reflexes by hitting a point just above the knee. If the lower leg jerks up, your reflexes are good. Other inflections of flectere: flexibility, flexion, inflect, inflected, inflexible, inflexibility, reflect, reflective. Something that ‘motivates’ us makes us want to do something-- moves us to action. 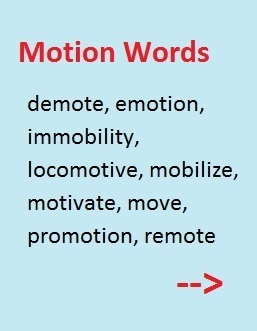 Commotion is a lot of movement with noise and confusion. To mobilize an army is to prepare it to move. When someone breaks a leg, the doctors immobilize it to help it heal. A remote location is far removed from city life and business. To compel someone is to drive (force) him or her to take action. To dispel is to drive away or eliminate clouds, darkness, or negative feelings: "The good news dispelled their anxiety." An impulse is an urge (within one’s own mind) to do something. Compulsion is similar, but stronger-- a feeling of being driven to do something. An impulsive person is inclined to act on impulses rather than thinking things through. Propellers are the turning blades that move a boat or airplane forward. More words from pellere: compelling, compulsive, compulsively, expulsion, impel, impulsively, propel, jet propulsion, pulsation. To compress is to press tightly together. Compression bandages press tightly against a wound. A depression can be a severe economic downturn OR feeling low (sometimes to the point of emotional or mental illness) OR a low place. Oppression is mistreatment or harsh rule over other people. To repress is to hold back OR to restrict freedom by governmental action. Other words from pressare: compressible, depress, expression, expressive, impress, impression, oppress, oppressive, pressure, repression, repressive, suppression. To attend is to be present at a gathering or to go there consistently. In the U.S., children attend school nine months of the year. Many professionals attend an annual conference, and marketers and buyers often attend trade shows. To contend is to struggle with or against someone or something. Distention is being stretched out of shape. If a person eats way too much, their belly may be so distended their clothes don’t fit. 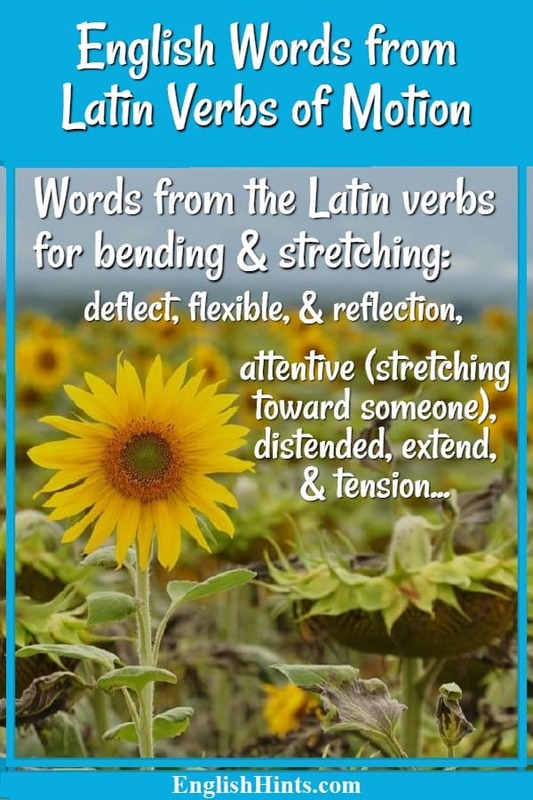 To extend is to stretch out or lengthen. When people cannot finish a project on time, they might ask for an extension. From a mountain peak there is an extensive view. To intend to do something is to plan and have a purpose to do it. If a person hurts someone’s feelings unintentionally, it means the hurt was not intended. In American courts, accidental damage (even manslaughter- accidental killing) is treated much less severely than intentional, premeditated damage or murder. intensive means with great effort: Summer school classes are short but intensive, as students must learn the same material in less time. To pretend means to act like something or someone we are not: a possum pretends to be dead so predators will not attack it. Other words that come from tendere: attentive, attentively, contention, contentious, distend, extensively, extent, intensely, intensification, intensity, intensively, intent, intention, intentional, intentionally, pretense, pretension, pretentious, tend (to), tense, tensely. Abstract words or thoughts are about ideas, things that cannot be touched, as compared to physical things that can be seen or handled. To attract is to draw or pull toward something or someone, as a moth is attracted to light. An attractive person is good-looking. A contract is a legally-binding business agreement. The verb to contract means to pull together or become smaller or tighter. Muscles contract or tighten as they work. If some defect detracts from the beauty of a building (for example), it takes away from its value and makes it less desirable. “The dancer’s stumble detracted from an otherwise impressive performance.” A detractor is someone who criticizes or finds fault with someone else’s work. To distract is to take someone’s attention away from his purpose. To extract is to pull out (as minerals are extracted from the earth.) An extract is a substance taken out of something else—most often a medicinal drink made from an herbal (plant) base processed in alcohol. A protractor is a tool for drawing circles. A protracted drought is a long dry period. In Congress they have protracted debates about controversial subjects—speeches and arguments that last way too long! When a person realizes he has said or written something that is inaccurate or harmful, he should retract it-- take back what was said and admit he was wrong. Traction involves pulling or resistance. Doctors put a patient with a broken leg in traction to pull his bones back into place. A tractor is a machine that pulls things on a farm. Other words from trahere: attraction, contraction, distractible, distractibility, distraction, extraction, retract, retractable, retraction, subtract. · as well as List of Prefixes, Negative Prefix List, and others linked to the Roots and Affixes page below. If you're interested in teaching roots, check out the inexpensive lessons and practice activities on Root, Prefix, and Suffix Worksheets.